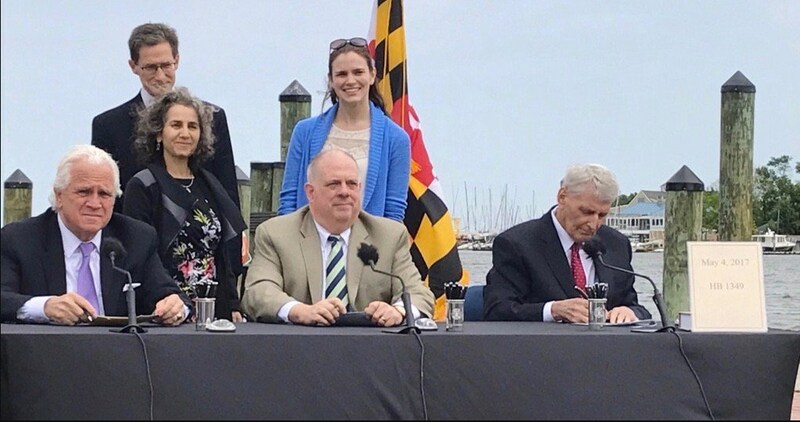 UPDATE: Maryland Governor Larry Hogan signed two bills on May 4 that were supported by local organics processors and groups such as the Institute for Local Self-Reliance. The first, HB0171, takes effect on July 1 and will require the Maryland Department of the Environment to study existing organics processing infrastructure. This will focus on current efforts and opportunities within the state, as well as existing systems in other states. The report will be due by July 1, 2019. “The goal of this current bill is to really shine a light on [the fact] that we still need to get people together to deal with specifically encouraging not only more diversion of yard waste and food residuals, but infrastructure,” said Brenda Platt, co-director of the Institute for Local Self-Reliance (ILSR). ILSR has been actively working with state officials and legislators for years to move Maryland forward on organics diversion. Platt pointed to the creation of state composting permits in 2015, and a composting bill that was recently passed in Montgomery County, as advancements in that process. The state still does not have a permitting system in place for anaerobic digesters. A version of this current bill was originally introduced in 2015 and would have set an organics diversion requirement based on accessibility to processing options similar to what has been done in states such as Vermont. That was unsuccessful, as well as a 2016 version that was closer to this latest draft. By requiring a study of processing infrastructure first, rather than setting the diversion requirement and expecting facility investments to follow, Maryland is taking a more pragmatic approach. As Platt noted, studying a wide range of opportunities for the reduction and diversion of organic waste has the potential to help more than the state’s landfill capacity.